Do you remember how Swedish department store Åhléns sparked a body image debate after pictures of their “normal sized” fashion dummies had appeared on social networking sites about a year ago? These mannequins have been used by Swedish company since 2010 because they realized their customers looked different from catwalk models. The reaction online was immense and has generated comment from as far afield as the U.S. This January, David’s Bridal announced that the brand would begin using real-looking mannequins and now JCPenney has followed the movement with dummies modeled after actual people. Needless to say, this sounds and looks pretty damn cool! JCPenney’s store made a little step forward while creating their mannequins compared to those shown in the Ahlens shop windows. 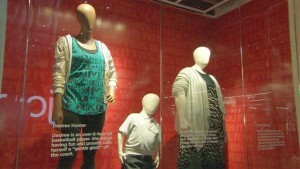 Each of the five mannequins that are currently on display at JCPenney’s store in the Manhattan Mall was modeled after a real person you could theoretically (and actually9 hand out with: a former Army paratrooper, a women in a wheelchair due to partial paralyisis, a college basketball player, plus-size mother and a man with dwarfism. 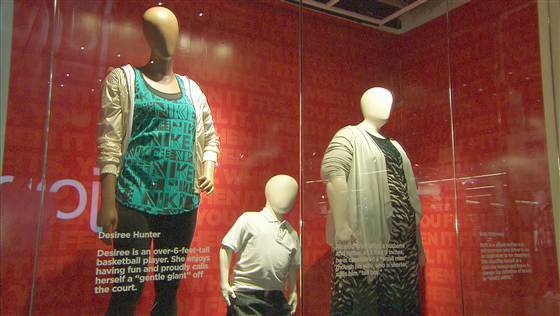 Body diversity in fashion retail is exactly that – showing people of all shapes, sizes and abilities! Although this is not the first time that the size of mannequins made the news, little seemed to change about it around the world. Back in 2007 health experts in UK called for making the dummy versions in that country more “realistic”. As a matter of fact, most mannequins in UK were reported to be a size 10, while the average size for women was 16! That inspired several department store chains to use mannequins ranging in size from 10 to 18, at least in smaller shops. Some mannequins are even styled to look older! Nevertheless, it seems UK high street didn’t take that piece of advice yet. It remains to be seen whether they would follow JCPenney’s store example. There was some negative feedback, though. Some critics say this movement might promote unhealthy lifestyle and obesity. Although we agree that people should give their best to be in pink, we still hope creepy and skinny mannequins will become the thing of the past!